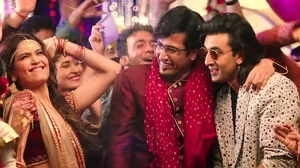 Ranbir Kapoor's 'Sanju' was one of the most-awaited releases of the year and it has rightfully delivered to the expectations that people had from it. The song 'Bhopu Baj Raha Hain' from the film has been unveiled on YouTube and it is a full-on party track! It has Ranbir, Vicky and Karishma dancing and partying. Karishma essayed the role of Sanju's best friend, Kamli's (Vicky Kaushal) girlfriend. Even though she has a small role in the film, the actress makes her presence felt. The song 'Bhopu Baj Raha Hain' was not used in the movie. The movie hit the screens on June 29 and entered the Rs 300 crore club in the third weekend of its release. The movie covers the life of Sanjay Dutt in mainly three stages and has an ensemble star cast including Anushka Sharma, Karishma Tanna, Vicky Kaushal, Sonam Kapoor, and Paresh Rawal to name a few. Ranbir Kapoor essays the titular role of Dutt. His hard work and massive transformation to look like the real-life Dutt has finally paid off. The positive response and good word of mouth publicity helped the film do even better. Besides Ranbir, the performance of every actor has been lauded in the film. 'Sanju' is directed by maverick filmmaker Rajkumar Hirani and is produced by Hirani and Vidhu Vinod Chopra.